Vitamin B12, or Cobalamin, is an essential vitamin necessary for the maintenance of the nervous system and for preventing anemia. A slight deficiency of vitamin B12 can lead to anemia, fatigue, mania, and depression, while a long term deficiency can potentially cause permanent damage to the brain and central nervous system. Vitamin B12 is synthesized by micro-organisms and can be found in some natural vegan foods like tempeh, seaweed, mushrooms, beer, wine, and yeast extract spread. Unfortunately, the amount of vitamin B12 in these foods can vary greatly, and even when they do contain vitamin B12, it is likely they do not contain enough to be a good source of vitamin B12 over the long term. Due to bio-accumulation and biomagnification meats and animal foods typically provide more vitamin B12, however, this same bio-accumulation effect is what makes meat accumulate metals and other toxins. Avoiding these toxins in meat is one of the health benefits of veganism. Without reliable natural vegan sources of vitamin B12, and without animal food products, fortified vegan foods are the only reliable and consistent source of vitamin B12 for vegans. Healthy vegan foods fortified with vitamin B12 include commercial cereals, fruit and vegetable juices, dairy substitutes, fortified tofu, and vitamin waters. Since all these foods have vitamin B12 added to them, their levels can vary greatly. Check product labels before buying. In addition to the fortified foods above, supplements can also be a cheap, healthy, and effective option to get enough vitamin B12. Below is a list of vegan foods highest in vitamin B12, for more, see also the article of vegetarian foods highest in vitamin B12, and cereals high in vitamin B12. The amount of vitamin B12 added to cereals can vary greatly, so be sure to check product labels. Here also is a list of cereals high in vitamin B12. Fruit juices can be high in sugar, so try to choose varieties with more fiber, or pulp, as well as added B12. Fortified fruit and vegetable juices are a better alternative to energy drinks or sodas. Other milk substitutes high in Vitamin B12 (%DV per 8oz glass): Fortified Almond Milk (50% DV), Foritified Coconut Milk Drink (50% DV), Fortified Rice Mik (25% DV). The amount of vitamin B12 can vary greatly, check product labels. How much Vitamin B12 is in Brewers Yeast? Brewers Yeast is a rich source of nutrients, typically used for making beer, but can also be used to make bread and other consumables. There are conflicting reports on how much vitamin B12 brewers yeast provides. The University of Maryland Medical Center states that it provides no B-12. However, the nutrition facts from Now Foods lists a whopping 4 micrograms (67% DV) of vitamin B12 in two tablespoons (30g) of brewers yeast. This is way more B12 than what you can get from Marmite or other yeast extracts. As stated in the introduction, natural vegan sources of vitamin B12 are inconsistent, so check product labels when possible. 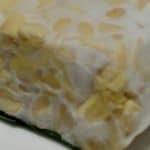 How much vitamin B12 is in Nori (Dried Seaweed)? Nori is the thin dried seaweed wrap typically used to make sushi rolls. According to this article published in the journal Nutrients, dried nori seaweed contains up to 51.7μg of vitamin b12 in 100 grams. A sheet of nori typically weights 1.25 grams so a single sheet would provide about 0.5μg of vitamin B12 or 8% DV. While this sounds great, it is unlikely that nori can be relied upon to be a consistent B12 source, so while it will make a good addition to a balanced vegan diet, it should not be solely relied upon. Further, nori seaweed is very high in iodine, and should be avoided by people with thyroid issues. The recommended daily allowance (RDA) for Vitamin B12 ranges from 0.4 to 2.8μg per day. This is quite a bit lower than the daily value (%DV) of 6μg. The daily value (%DV) is higher since excess vitamin B12 is well tolerated by the body, and so that certain groups with a risk of deficiency get plenty of vitamin B12 in their diet. Further, the daily value is also often higher than the RDA to account for absorption factors that can occur in a diverse diet. Eussen SJ, de Groot LC, Joosten LW, Bloo RJ, Clarke R, Ueland PM, et al. Effect of oral vitamin B-12 with or without folic acid on cognitive function in older people with mild vitamin B-12 deficiency: a randomized, placebo-controlled trial. Am J Clin Nutr 2006;84:361-70. Hvas AM, Juul S, Lauritzen L, Nexo E, Ellegaard J. No effect of vitamin B-12 treatment on cognitive function and depression: a randomized placebo controlled study. J Affect Disord 2004;81:269-73. Vital Trial Collaborative Group. Effect of vitamins and aspirin on markers of platelet activation, oxidative stress and homocysteine in people at high risk of dementia. J Intern Med 2003; 254:67-75. Kang JH, Cook N, Manson J, Buring JE, Albert CM, Grodstein F. A trial of B vitamins and cognitive function among women at high risk of cardiovascular disease. Am J Clin Nutr 2008;88:1602-10. Aisen PS, Schneider LS, Sano M, Diaz-Arrastia R, van Dyck CH, Weiner MF, et al. ; Alzheimer Disease Cooperative Study. High-dose B vitamin supplementation and cognitive decline in Alzheimer disease: a randomized controlled trial. JAMA 2008 ;300:1774-83. Schulz RJ. Homocysteine as a biomarker for cognitive dysfunction in the elderly. Curr Opin Clin Nutr Metab Care 2007;10:718-23. Wang HX, Wahlin A, Basun H, Fastbom J, Winblad B, Fratiglioni L. Vitamin B12 and folate in relation to the development of Alzheimer?s disease. Neurology May 8, 2001 vol. 56 no. 9 1188-1194. Patrick Kidd and David L. Mollin. Megaloblastic Anaemia and Vitamin-B12 Deficiency After Anticonvulsant Therapy. Br Med J. 1957 October 26; 2(5051): 974?976. J.S. MALPAS, G.H. SPRAY, L.J. WITTS. Serum Folic-acid and Vitamin-Biz Levels in Anticonvulsant Therapy. British Medical Journal. 16 April 1966. Richard Hunterb, Joanna Barnesb, and D. M. Matthews. EFFECT OF FOLIC-ACID SUPPLEMENT ON SERUM-VITAMIN-B12 LEVELS IN PATIENTS ON ANTICONVULSANTS. The Lancet, Volume 294, Issue 7622, 27 September 1969, Pages 666-667.